This family-friendly Jaipur hotel is located near the airport, within 2 mi (3 km) of Jal Mahal, Johri Bazaar, and City Palace. M.I. Road and Nahargarh Fort are also within 3 mi (5 km). 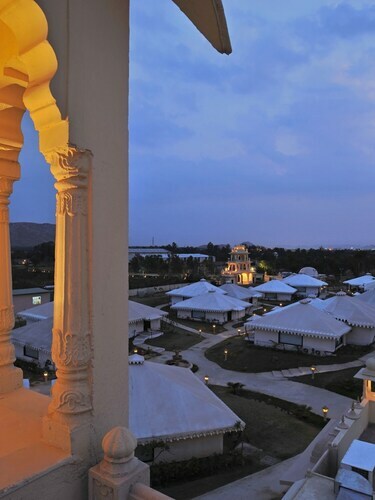 This family-friendly resort is located in Amer, where area attractions include Nahargarh Biological & Zoological Park. Regional attractions also include Jal Mahal and Hawa Mahal. Set in Amer, this family-friendly resort is within 9 mi (15 km) of Nahargarh Biological & Zoological Park, Jal Mahal, and Amber Palace. Johri Bazaar and M.I. Road are also within 12 mi (20 km). 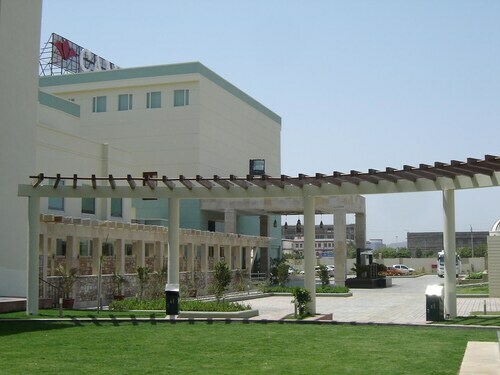 Located in Sindhi Camp, this hotel is within 3 mi (5 km) of Central Museum, City Palace, and Jantar Mantar. Amber Fort is 8.9 mi (14.3 km) away. Sindhi Camp Metro Station is 7 minutes by foot and Jaipur Railway Station is 17 minutes. 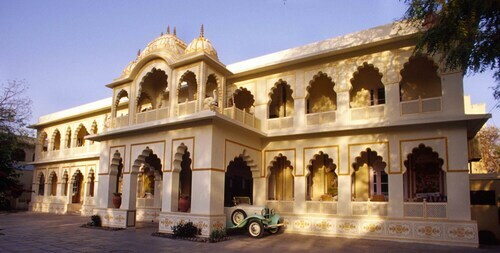 Located in the heart of Jaipur, this historic hotel is within 1 mi (2 km) of Station Road and M.I. Road. City Palace and Johri Bazaar are also within 2 mi (3 km). Sindhi Camp Metro Station is 18 minutes by foot. Situated in Jaipur, this spa hotel is 2.9 mi (4.7 km) from Sisodia Rani Palace and Garden and 5.4 mi (8.6 km) from Galta-Monkey Palace. Amber Fort and Nahargarh Fort are also within 20 mi (32 km). 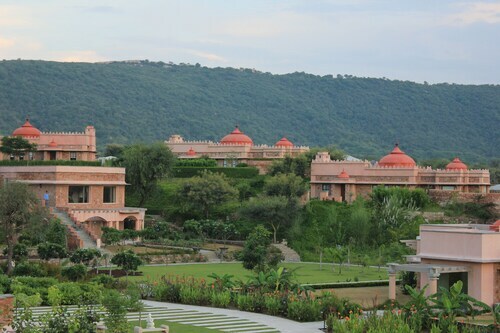 Set in Jaipur, this family-friendly resort is within 12 mi (20 km) of World Trade Park, ISKCON Jaipur, Sri Sri Giridhari Dauji Temple, and M.I. Road. Ajmer Road and Sansar Chandra Road are also within 12 mi (20 km). 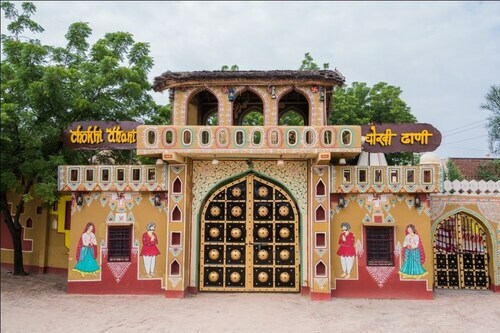 Located in Sanganer, this luxury hotel is 0.5 mi (0.9 km) from World Trade Park and 3 mi (4.8 km) from ISKCON Jaipur, Sri Sri Giridhari Dauji Temple. Sawai Mansingh Stadium and M.I. Road are also within 6 mi (10 km). 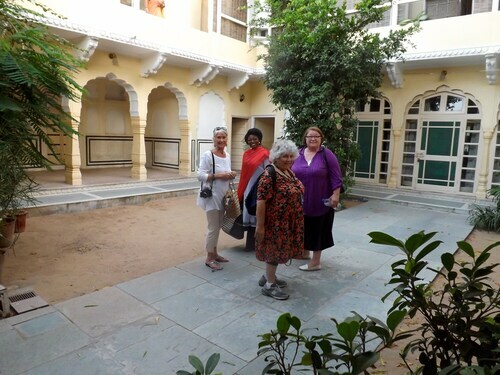 Located in Pink City, this historic hotel is within 1 mi (2 km) of Station Road, M.I. Road, and City Palace. Johri Bazaar and Nahargarh Fort are also within 2 mi (3 km). Sindhi Camp Metro Station is 20 minutes by foot. Located in Sanganer, this hotel is 0.6 mi (1 km) from World Trade Park and within 6 mi (10 km) of Sawai Mansingh Stadium and M.I. Road. Johri Bazaar and ISKCON Jaipur, Sri Sri Giridhari Dauji Temple are also within 6 mi (10 km). Is your anniversary quickly approaching? Maybe you’re looking for the perfect honeymoon getaway? Or, has it just been too long since you and yours had some quality alone time away from the hectic schedule of everyday life? Take a steamy trip and stay at one of the most romantic hotels in Jaipur District. Remember the feeling of first meeting your significant other? You were nervous and excited. It felt like talking to your first crush on the playground. Re-ignite those feelings with an unforgettable stay to one of the Jaipur District romantic hotels. Treat your loved one to a perfect day with breakfast in bed, a day at the spa and then a sultry dinner at a top restaurant in Jaipur District. After dinner, take a moonlit walk through one of the city’s beautiful parks, because nothing says romance like a stroll under the stars. Whether you have been together for a few weeks or 50 years, the romantic hotels in Jaipur District are the perfect weekend getaway for you and your loved one. You’ll also be feeling affectionate toward Travelocity when you browse our vast selection of accommodations that cater to couples. 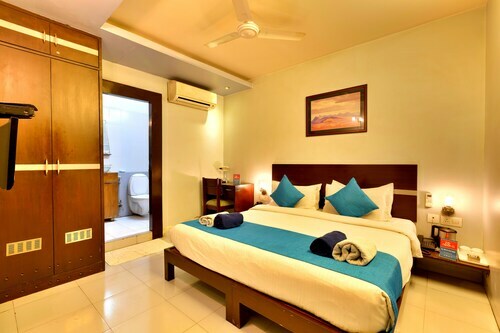 We have unbelievable deals on the best romantic hotels in Jaipur District, so you don’t have to worry about breaking the bank for your trip. Book now and let the honeymoon begin. The service at the reception was good. The room needed a little fresh air and it would be nicer if the bathroom had a showe door so the water would not splash out. Clean rooms and they have a good variety of food in their restaurant. 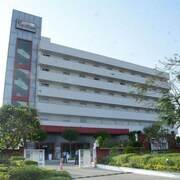 5.0 Great Hotel in Jaipur. My associate and I had two hotels on this trip, this one and another 4 star in New Delhi. By a wide margin this hotel beat the pants off the 4 star in Delhi. Great staff clean rooms and a wonderful breakfast. if we were to visit Jaipur again we would be staying here. From handing over your passport at checkin, to your first meal, the staff knows who you are, what room you are in and what beverage you had last. The entertainment, from the sitar and drums at breakfast on the patio, to the dancers on the patio at dinner, there is shopping available on site and the landscaped lawns are host to many elegant weddings and birthday parties, both had fire works when I was there, such a treat! 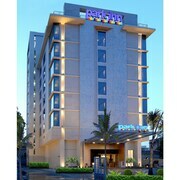 i loved this hotel, especially its garndeour. the service and the grounds were absolutely magnificent. 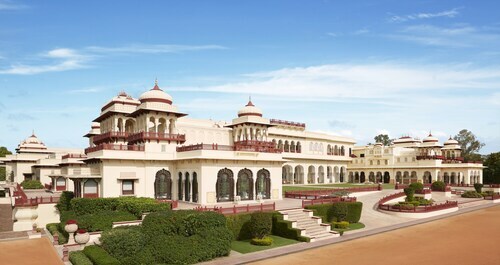 rated one of the world's top 500 hotels, the rambagh palace leaves a little to be desired. i highly recommend it -- it's worth every penny.